Odisha is one of the major maritime States, offering vast scope for development of inland, brackishwater and marine fisheries. The State’s 480 km long coastline with 24,000 sq. km area within the continental shelf has ample potential for marine fisheries development. Freshwater resources of the State are estimated to be 6.76 lakh ha comprising 1.25 lakh ha of tanks/ponds, 2 lakh ha of reservoirs, 1.80 lakh ha of lakes, swamps & jheels and 1.71 lakh hectares of rivers and canals. The State’s brackishwater resources are of the order of 4.18 lakh ha with a breakup of 0.79 lakh ha of Chilika Lake, 2.98 lakh ha of estuaries, 32,587 ha of brackishwater area and 8,100 ha of backwaters. 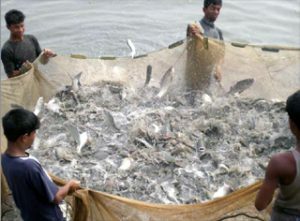 By judiciously harnessing these resources, the fish production from capture and culture based capture fisheries could be substantially augmented to meet the domestic market demands, increase in export apart from createing employment and income generating opportunities for the rural poor and enhance their food, nutritional and livelihood security. The fishery sector in Odisha is faced with low levels of literacy and relatively high levels of debt. This calls for a paradigm shift in the way fisheries is regulated and managed. The challenge, in this context, is to develop a long term policy and strategies allowing for the balanced and sustainable management and development of the fishery sector in Odisha. A new policy environment could spur overall development of the fisheries sector. In the marine fisheries sector the Odisha Marine Fishing Regulation Act and in the Inland fisheries, the Reservoir Fisheries Policy 2012 are the principal legislation/policy for managing fisheries. A clear and comprehensive Fisheries Policy supported by a legal and institutional mechanism, therefore, is an essential pre-requisite for preparation of a new legislation to effectively address sectoral concerns. The total fish production of the State in 2013-14 was 4,13,000 tonnes. The overall increase in fish production during the past five years from 2007-08 to 2012-13 was in the order of 63,660 tonnes, with an annual growth rate of about 3 percent. While the fish production from the inland fisheries (Freshwater and brackishwater) resources has increased from 2,18,716 tonnes to 2,94,000 tonnes, the marine fish production declined from 1,30,767 tonnes to 1,20,000 tonnes during the corresponding period. The annual per capita fish consumption presently is 9.13 kg in Odisha as against the national per capita fish consumption of 9.8 kg. The average productivity of the reservoirs in the State was around 9.3 kg per ha as compared to the national average of 15 kg/ha. As a result of application of appropriate management measures such as continuous stocking of advanced fingerlings based on the provisions as contained in the State Reservoir Fisheries Policy notified in the year 2012 the productivity of the reservoirs has increased to 93 kg/ha. where intervention made. There are 17,973 fishing crafts operating in the State’s coastline for marine fishing, of which 1,754 are mechanized, 6,734 are motorized and 9,485 boats are non-motorized. Trawlers account for 85 percent of the mechanized boats. There are one major fishery harbor (FH), three minor fishery harbours and 69 fish landing centres in Odisha. There is a proposal to construct 3 minor fishing harbours at Chandipur (Balramgadi of Balasore district), Chudamani (Bhadarak district) and Bahabalpur (Balasore district). The major fishery harbour at Paradeep and three minor fishery harbours one each at Gopalpur, Nuagarh (Astarang) and Dhamra Stage-I have been completed and commissioned. Out of 28 fish landing centres which were targeted to be provided with a jetty, 23 have been completed and the remaining 5 are under various stages of construction. National Fisheries Development Board (NFDB) has approved and provided fund for upgradation of 7 FH/ Fish Landing Centres. The annual export of marine products from Odisha during the last five years ranged between 14,135 tonnes in 2008-09 and 30,980 tonnes (2013-14) valued approximately at ` 357.88 crore to ` 1800 crore. Contribution of Odisha to the present level of marine products exported from the country is about 2.5 percent in terms of quantity and 4.8 percent in terms of value. For developing inland fisheries, the Department of Fisheries has 106 fish farms, out of which 27 are fish breeding farms with hatcheries and the private sector has 89 fish breeding farms. Presently there are 108 fish seed hatcheries in Odisha with the designed capacity for producing around 70 crore fry. Resource depletion aggravated by use of destructive fishing gears and methods. Inadequate information on the fisheries resources and the state of the aquatic environment to guide management decisions. Inappropriate regulatory framework and inappropriate mechanisms for controlling access to fisheries resources. Inadequate mobilisation and involvement of the communities in development and management of fisheries resources. A difficulty in imposing any limitation or stringent action on over-fishing, as fishing is a livelihood option for majority of poor people. Siltation of the fishery harbours and fish landing centres because of the natural littoral drift, and human pressures making most of them non-operational. Majority of small fishing boats lack modern fishing facilities and equipment. Clandestine import and introduction of disease infected fish/ shrimp seed in culture systems. Natural calamities such as unprecedented rain, cyclones and floods, leading to destruction of coastal structures, fish/ aquaculture ponds and systems. Sustainable development of inland, coastal and marine capture and culture fisheries are promoted so as to attain self sufficiency in fish production for domestic consumption and development of seafood industry. Contribution of the fisheries sector to food, nutritional and livelihood security of the people of the State of Odisha and our nation, is enhanced. A balanced approach to fisheries management based on sound ecological, economic and precautionary principles is promoted to ensure that fish populations remain viable, productive and accessible to future generations. An efficient value-chain and an organized and secure marketing/ supply system/ chain for fish and fishery products is created so as to protect the producers’ and consumers’ interest and to augment marine products export and foreign exchange earnings to the State of Odisha. Infrastructure facilities for aquaculture clusters and for landing and berthing of fishing crafts are augmented. Public–private partnership and community participation for developing, managing, conserving and sharing the fishery resources, is promoted for the benefit of our society. Human resource base for fisheries management and development is created through capacity building. Quantitative and qualitative appraisal of the fishery resources and their potential in the State of Odisha. Enhancing the productivity and production of fish from the inland, brackishwater and marine resources and doubling the fish production in the next five years. Tapping the untapped potential of aquaculture to contribute to food and nutritional security. Quality seed production in inland sector. Bridging the gap between the demand and supply of fish for domestic consumption. Capacity building, technological intervention, Human Resource Development, Research & Development, Awareness building and Education of fisherfolk and other stakeholders. Upgradation of infrastructure facilities like FH, Fish Landing Centre (FLCs), cold chain, communication, etc. Upgradation of the overall quality of fish with emphasis on hygienic post harvest handling. Generating additional/ supplementary employment opportunities in the rural sector for the fishers, educated unemployed youth and others. Alleviating the incidence of poverty among fishers by offering them alternative/ supplementary employment opportunities, health care, communication and sanitary facilities and quality education to children and youth. To develop Chilika fishery as a fully managed, sustainable fishery with stakeholder participation.